I'd probably use ones like 'worst', 'game' and 'ever'. Ok, maybe that's a little harsh, but any similarity to the game's namesake has sadly been wiped out in the conversion to the SMS. The only similarity is that the game is of 'one-on-one' fighting format... that is it... really. The concept is obviously simple - beat up your opponent to win, and follow the storyline between rounds until it reaches its climax. What is very strange about Virtua Fighter Animation is firstly that there is nothing 'virtua' about it, and secondly that the programmers seem to have paid more attention to the scenes linking each round than to the game itself! While fighting, the graphics are diabolical. 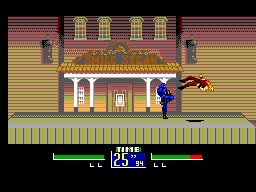 They would have been poor for a game released in 1986, let alone one ten years later with such graphical masterpieces as Mortal Kombat, Cool Spot, nearly all the Disney titles etc. in the interim. 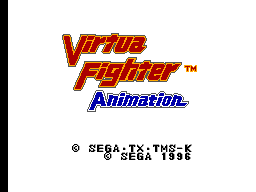 The character sprites are tiny and badly animated - in fact, as well as having nothing 'virtua', I'd argue that there's very little 'animation' either! Backgrounds are un-detailed too. Very, very, VERY disappointing. In contrast, the scenes that create a story between rounds are very detailed and colourful. Note to programmers - couldn't care less about the story, would have been nice if you'd paid the same amount of attention to the actual game! Very average. The sound doesn't quite make you want to gnaw your own hands off, but only because that would mean you could never turn the game off and be stuck in a perpetual virtua fighter animation hell. Rubbish tunes and basic sound effects throughout. Unresponsive and frustrating. 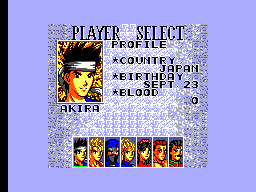 This must be the only fighting game I can think of where you can't even perform a jump and a kick at the same time. No, instead at first you'll jump, foolishly thinking "Aha!! I'm gonna get you now!!" regarding your opponent in the game, only to realise that in fact no - you're just jumping rather dumbly straight into their path for them to kick or punch you down as you furiously hit either button to no avail! Seriously, you would stand as much chance of forming a detailed assault plan with this game as you would if you played the entire game with your eyes closed - I honestly am not exaggerating in the slightest. None, whatsoever. The game has NO redeeming features for you to want to come back for more. I completed it in my very first sitting, within approximately 30 - 45 mins play, losing only one round in the entire game from start to finish. What's the point in going back to do it again?... Ever??? Terrible gameplay, awful graphics, blood curdling sound, frustrating controls, a complete lack of anything resembling a special move (except a slight variation of a kick!! ), and the sheer ease it takes to beat the game makes it one of the most disappointing conversions ever. But you want the twist? In a weird kind of Championship Hockey type way, I actually quite like it!!! !